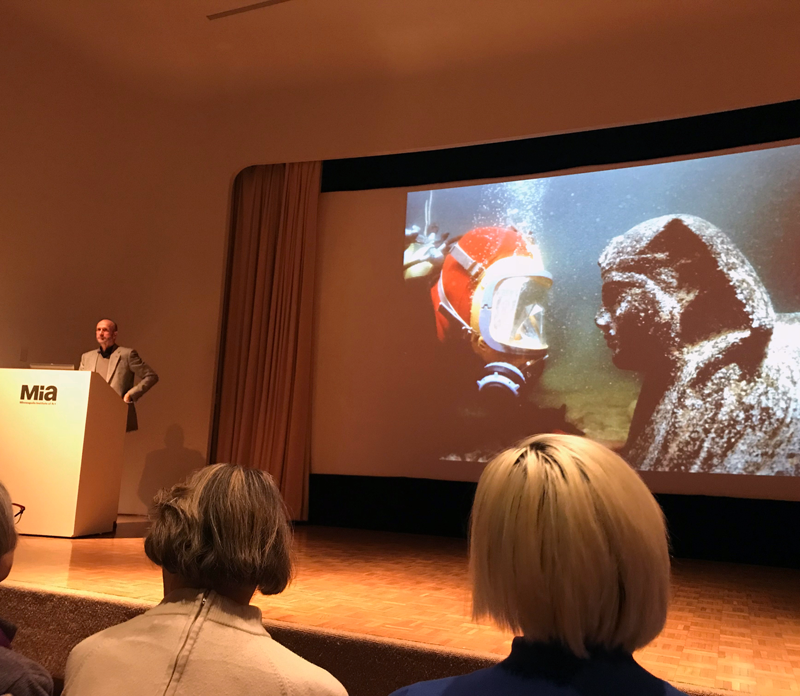 Egypt’s Sunken Cities at the Minneapolis Institute of Art is an exhibit that shouldn’t be missed. The exhibit runs from November 4, 2018 - April 14, 2019, and I had the opportunity to visit during the member’s exclusive preview week. I saw the exhibit before it was open to the general public and took in a lecture from Franck Goddio who discovered the site and who has worked over 20 years uncovering the sunken city. I was really excited to see treasures lost to time by of the power of mother nature. And entering the exhibit I thought I knew what to expect. I couldn’t wait to see the Egyptian artifacts. There was a stele that was perfectly preserved. This is where the twists begin. The archaeologists thought they were looking for two cities, but the stele revealed that there was only one city. The city was referred to by the Egyptians as one name and the Romans referred to the city as another. All the experts thought they were looking for two cities but the pristine stele served as as a reminder that even the experts can be fooled by history lost. The stele was found facedown underwater. This preserved the face from erosion. 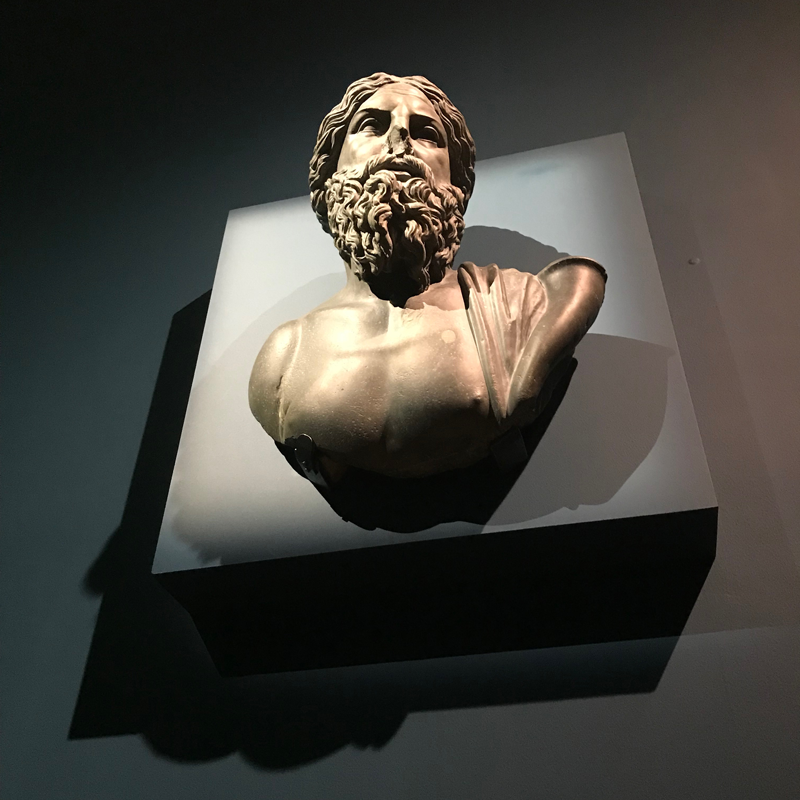 I then saw a bust that was in the traditional style of Greek sculpture and information about the crossover of gods between the different cultures. This idea was a fascinating one to me. Even now we argue about our religions and cultures and here was a display of how they were all one in the same. Throughout the exhibit there were objects that I didn’t expect to see and I found them inspiring. There was an incense burner with the Greek version of a sphinx. Unlike the Egyptian sphinx that is typically male, this version was female with wings. The idea that an archetype character could change attributes and gender depending on culture was never something I had considered as a possibility. I was so inspired by the majesty of this object I had to draw it. There were also a stunning Greek black-figure cup found at the site. I loved the idea that something was found that was considered surprising based on the style. I loved the design so much I recreated it. I imagined what the missing parts could look like. 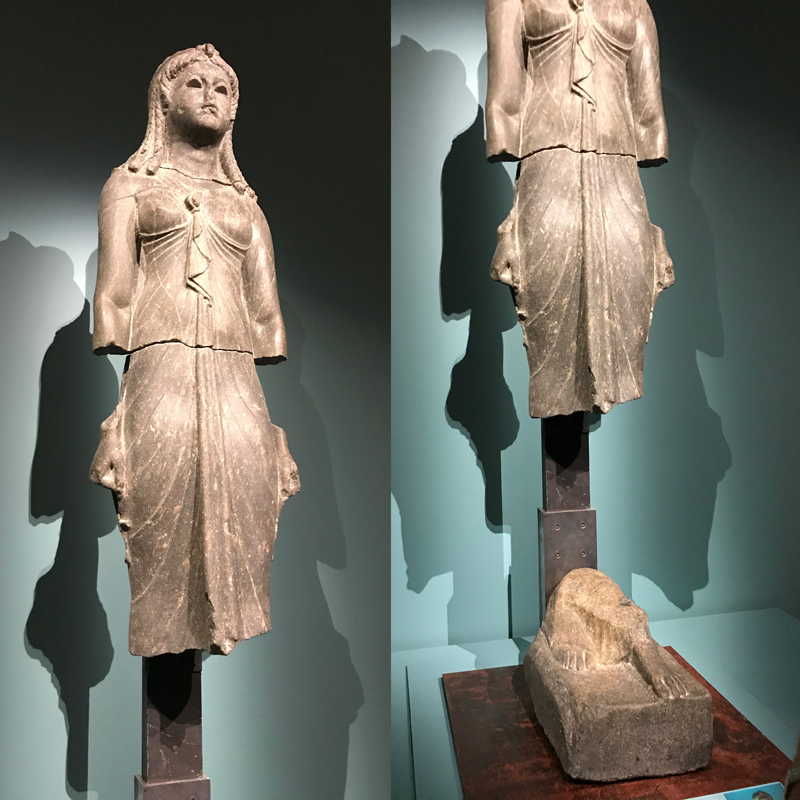 But the most visually stunning and surprising works to me were the statues that appeared to combine Greek and Egyptian attributes. I had never seen anything like it. The curly hair and the draped clothing all were traditionally greek. Yet the statues were stepping forward in a traditional Egyptian pose. One of the statues was even holding an Egyptian ankh in their hand. It was such a seamless combination of the cultures and aesthetics. It is amazing to me how stone can be carved so that it looks like a thin sheath of material. I then attended the lecture by Franck Goddio. I sat down next to a transgender woman with a very warm smile and we discussed all our favorite exhibits from the past few years. We loved all the same ones. And we laughed how we even disliked the same one for all the same reasons! During the lecture it was fascinating to hear Franck Goddio talk about his findings and what is takes to uncover a site like this. He focused mainly on the ritual items found but my mind still was swirling with all I had seen. This exhibit really stuck with me. The exhibit was an ancient representation of cross-culture, cross-gender, and cross-religion unity that we so often put into boxes and separate. Even the experts throughout history thought they were looking for two cities and history handed them a stele saying that it was one. It was a visual and visceral journey questioning preconceived notions of differences throughout history and modern times. So often we look for differences, but in reality we probably aren’t all that different after all.